Voting Rights Act. (2012). In B. Benenson & D. Tarr, American government A to Z: elections A to Z. (4th ed.). [Online]. Washington: CQ Press. Available from: https://search.credoreference.com/content/topic/voting_rights_act_of_1964 [Accessed 26 April 2019]. "Voting Rights Act." American Government A to Z: Elections A to Z, Bob Benenson, and David Tarr, CQ Press, 4th edition, 2012. Credo Reference, https://search.credoreference.com/content/topic/voting_rights_act_of_1964. Accessed 26 Apr. 2019. (1965) US legislation authorizing federal authorities to check registration and voting procedures in order to protect the rights of black voters in nine southern states. Within a year of its passage, the number of blacks registered in five 'Deep South' states increased by almost 50%. Passage of the Voting Rights Act of 1965 authorized direct federal action to help African Americans register and vote. Earlier black suffrage legislation required affected groups or individuals to seek court action to obtain the rights being protected. Other than the Fourteenth Amendment to the Constitution, which guaranteed equal protection of the laws, perhaps no single document matched the Voting Rights Act in righting the wrongs of discrimination against the descendants of slaves. Within months of the act's passage, a million southern black voters had been added to the rolls. And within a few years, black elected officials numbered in the thousands, mostly in the South. President Lyndon B. Johnson pushed through the bill over the strenuous states' rights opposition of southern delegations in Congress. He signed it into law on August 6, 1965. The act suspended the use of literacy tests and similar devices that had been used to keep African Americans from voting. It authorized the U.S. attorney general to supervise elections in states and their political subdivisions where voting registration had fallen below 50 percent or where the voter turnout was below that level in the 1964 presidential election. Initially, the act brought the federal machinery to bear in seven states, mostly in the South—Alabama, Georgia, Louisiana, Mississippi, South Carolina, and Virginia; the seventh was Alaska. Parts of Arizona, Idaho, and North Carolina were included, and other states were later brought under the act's provisions. By 1989 it covered all or parts of sixteen states. While most major provisions of the Voting Rights Act are permanent law, some parts were set to expire after a set period. But Congress has approved repeated extensions of almost all of these provisions and has even expanded some of them. With the federal Voting Rights Act amendments enacted in 1982 set to expire in 2007, another twenty-five-year extension of the nonpermanent provisions was cleared by the Republican-controlled Congress in 2006 and signed into law by President George W. Bush that July. The reauthorization was named after Fannie Lou Hamer, Rosa Parks, and Coretta Scott King, three southern women who were giants in the civil rights movement in the 1960s. 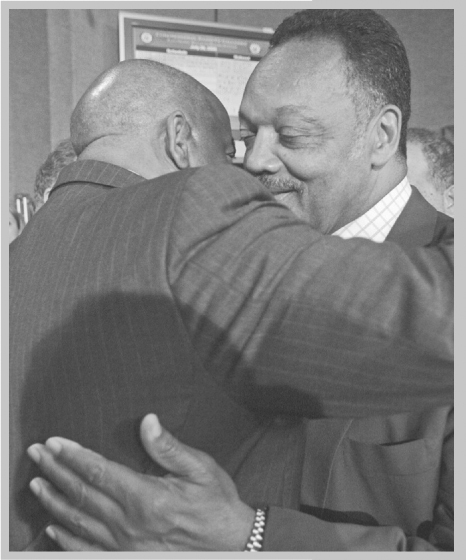 Rep. John Lewis of Georgia embraces Jesse Jackson in July 2006 after the Senate cleared a twenty-five-year extension of expiring provisions of the 1965 Voting Rights Act. The 2006 measure was enacted over the objections of some lawmakers and officials from states covered by the section 5 “preclearance” provisions, which require them to get approval from the U.S. Justice Department or the federal district court in Washington, D.C., for any changes to their election procedures and district maps. The affected states argued unsuccessfully that the preclearance provisions were unnecessarily time-consuming and expensive, given the removal of strictures against minority voting, the vast increase in black voter registration and participation, and the sizable roster of black elected officials in their states. 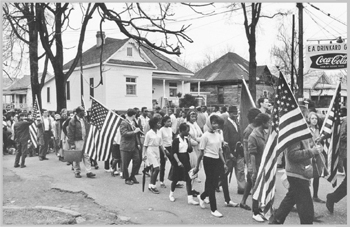 Impetus for the Voting Rights Act came from events in Selma, Alabama, on March 7, 1965, when state and local election officials interfered with African American demonstrations against discriminatory voting practices. Led by the Reverend Martin Luther King Jr., civil rights activists set out to march from Selma to the capital at Montgomery. They hoped to dramatize their drive to register voters in Dallas County, where only 2.1 percent of the eligible black voters were on the rolls. Six blocks into the fifty-mile march, the civil rights demonstrators were confronted by police and white protesters. When the marchers tried to retreat, they were clubbed and tear-gassed as national news media televised the scene. Johnson and his predecessor, John F. Kennedy, both Democrats, had been under pressure from black leaders since the 1960 election. Kennedy's narrow victory over Republican Richard M. Nixon had been achieved with crucial help from black voters, who were growing impatient for help in return. The 1963 assassinations of Mississippi civil rights leader Medgar Evers and Kennedy himself added impetus to the black leaders' efforts. The Kennedy and Johnson administrations had won passage of civil rights acts banning discrimination in areas of public accommodation such as hotels, restaurants, and theaters. The new laws also brought minorities somewhat closer to realization of their right to vote. For example, a 1960 law authorized the appointment of federal officials to monitor elections. And the 1964 Civil Rights Act eased procedures for federal authorities to look into voting rights cases. Also, the Twenty-fourth Amendment (1964) banned the use of poll taxes in federal elections. Against this background, Congress went to work on Johnson's voting rights proposal. An expected Senate filibuster never materialized. Instead, southern opponents tried to weaken the bill with a series of amendments, most of which were defeated by margins of 2 to 1 or 3 to 1. One of the most controversial provisions was a flat ban on poll taxes, which were still permissible in state and local elections despite the Twenty-fourth Amendment. To win the bill's passage over adamant southern opposition to the poll tax ban, the floor managers dropped the outright ban. The bill as finally enacted merely called for the attorney general to seek court action against enforcement of poll tax laws. In 1966, however, the Supreme Court ruled that poll taxes were unconstitutional in state and local elections as well as federal elections. The day after Johnson signed the Voting Rights Act, the Justice Department sued to eliminate Mississippi's poll tax. It took similar action three days later against Alabama, Texas, and Virginia. On August 10, the department suspended literacy tests and similar voter qualification devices in Alaska and the six southern states where registration was below the 50 percent “trigger.” The affected states and counties were required to obtain federal approval (preclearance) before changing their voting laws or procedures. President Johnson announced that in the first nineteen days under the new law, examiners had registered 27,385 blacks in three southern states. In one day alone in Selma, 381 blacks had been put on the rolls—more than all the black registrants there in the previous sixty years. By November the number would rise to nearly eight thousand. President Lyndon Johnson presented a new voting rights proposal to Congress after state and local police interfered with marchers in Selma, Alabama, in March 1965 as they demonstrated against voter discrimination. In March 1966, the Supreme Court upheld the Voting Rights Act in South Carolina v. Katzenbach. (Nicholas deB. Katzenbach was the U.S. attorney general.) The Court said Congress had acted within its powers under the Fifteenth Amendment (1870), which authorized the enactment of “appropriate legislation” to enforce the right to vote. Several times in the following two decades Congress amended the Voting Rights Act to extend the section 5 enforcement authority (1970, 1975, 1982), cover voters who primarily speak Spanish or other languages besides English (1975), and overturn a 1980 Court decision that required proof of discriminatory intent (1982). The 1975 amendments required bilingual ballots in jurisdictions where more than 5 percent of the population was non-English-speaking. As the Voting Rights Act continued to revolutionize southern politics, resulting in larger numbers of elected African American officials, states and individuals filed more challenges to the act's legality. After the 1990 census, some of the challenges dealt with the problems of racial redistricting. In 1969, in Allen v. Virginia Board of Elections, the Supreme Court upheld the government's enforcement authority under section 5, which required renewal by Congress five years after passage of the act. The case concerned two proposed changes in local election procedures, from districtwide elections to at-large elections, and from elected to appointed county superintendents of education. The Court consolidated the Virginia case with one from Mississippi. Officials of both states had contended that electoral decisions were not covered by the Voting Rights Act. In 1980 the Court handed voting rights activists another setback by ruling in Mobile v. Bolden that intent to discriminate had to be shown for there to have been a violation of section 2 of the act. Unlike section 5, which Congress had to renew after taking into account registration improvements in the covered jurisdictions, section 2 was permanent and covered the entire nation. Civil rights lawyers took their complaints to Capitol Hill in 1982 when section 5 was due for renewal. Under a House-Senate compromise, section 2 was revised to overturn the Mobile decision. The compromise retained House wording that an election procedure could violate the act if it “results in the denial or abridgment” of the right to vote. But Senate language was added based on the 1973 White v. Regester decision, which required a court to look at the “totality of the circumstances” before determining whether a violation existed. The compromise also stipulated that minority groups did not have a “right” to proportional representation and that lack of such representation was only one circumstance a court could consider in a voting rights case. Four years later, in Thornburg v. Gingles (pronounced “jingles”), the Supreme Court upheld the revised section 2 and set out the criteria needed to prove a violation existed under the provision. The essential elements were whether a minority-majority district could be created, whether minority voters tended to vote for particular candidates, and whether white-bloc voting usually defeated minority-preferred candidates. The Court rejected the argument that once one or more black candidates have been elected from a challenged district, the district is immune from challenges under the Voting Rights Act. Barely five months after the Gingles decision, Mike Espy became the first black elected to Congress from Mississippi since Reconstruction, bringing to four the total number of African American House members from southern states. When the 112th Congress, elected in 2010, began work in January 2011, there were forty-two blacks in Congress, all of them in the House; the Senate had no blacks. South Carolina's James E. Clyburn was serving as assistant Democratic leader, the third-ranking position in his party's leadership, making him the highest-ranking African American official in the history of the U.S. Congress. Though they were long allied with the Republican Party because of its historical ties to Abraham Lincoln and its effort to end slavery, blacks shifted their support to the Democratic Party, beginning with the social programs of Franklin D. Roosevelt's New Deal during the 1930s and then overwhelmingly with the national Democratic leadership's adoption of the civil rights cause in the 1960s. All of the black members in the 110th Congress were Democrats, and black voters often gave 90 percent or higher support to Democratic candidates for president and Congress. The 1993 Supreme Court decision in shaw v. reno focused new attention on the concept of cumulative voting as an alternative to the existing winner-take-all system of congressional elections. Under cumulative voting, voters in, for example, a five-member at-large district would each have five votes. They could cast all five votes for one candidate, or they could divide up their votes among the candidates. In Shaw the Court reinstated a challenge to two oddly shaped North Carolina congressional districts drawn to have a black majority in each district. Both districts elected African Americans in 1992, the state's first black members of Congress in ninety years. North Carolina had drawn the districts under pressure from the Justice Department as enforcer of the Voting Rights Act. The Court said, however, that it appeared the state had engaged in racial gerrymandering. A better way to ensure minority rights, some voting rights advocates believe, would have been for the state to create three large districts with multiple representatives elected under the cumulative voting system. Federal law, however, requires single-member congressional districts with representatives elected under the winner-take-all method. The only at-large voting for U.S. representatives takes place in states entitled to only one House seat. Cumulative voting requires multimember districts. Although it is currently barred for federal elections, cumulative voting has been tried for local elections, and some political scientists view it as worth examining in the continuing search for effective minority voting participation at the state and national levels.